How to separate sales order revenues from return order revenues? Some of you might have noticed that Dynamics AX uses the same revenue accounts for posting sales order revenues and return order revenues. The underlying reason for this behavior is that Dynamics AX treats both order types – from an accounting perspective – similarly and always refers to the revenue accounts that are setup in the inventory posting form. Please see the following screenshot. Many accountants are very unhappy about this standard behavior as sales orders revenues and return orders revenues are mixed in the same ledger account, which can make monthly reporting cumbersome. Fortunately, several approaches exist that allow differentiating sales order revenues from return order revenues. Within this blog post I will illustrate you some of those approaches together with the advantages and disadvantages of applying them in a live environment. The first approach how one can post return order transactions on a revenue account different from the one that has been setup in the inventory posting form is to overwrite the default main account in the return order form. 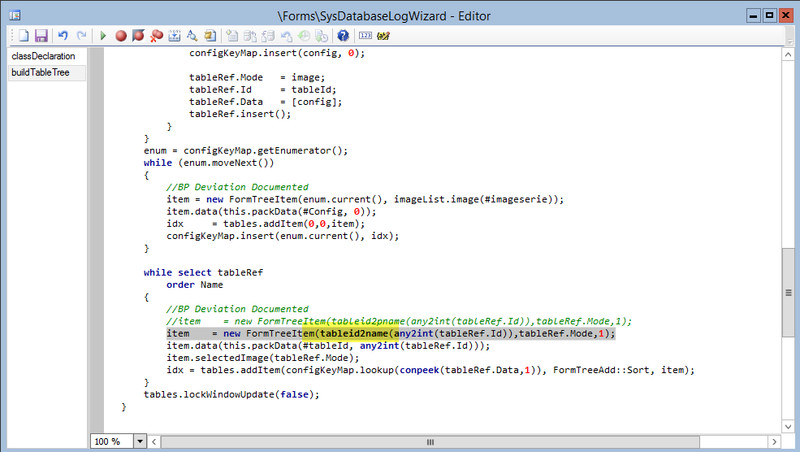 Please see the following screenshot for an example. This change ensures that the main account entered is used when posting the credit note for the customer. The next screenshot shows you the result of my test transaction. The major advantages of this first approach are its simplicity and the fact that no system modification is required. Those advantages do, however, come at a price. The price is that the process can easily consume lots of time, especially if many return orders / return order lines need to be adjusted manually. A second disadvantage of this approach is that the process is – due to the required manual main account change– likely to result in errors. 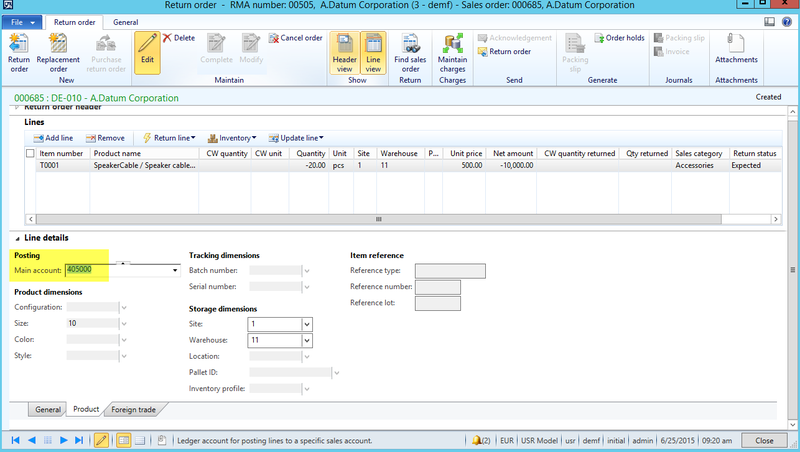 A second possibility for separating ordinary sales order revenues from return order revenues is using the inventory financial link functionality that builds upon using financial dimensions and not main accounts for identifying and separating return order sales. This approach is based on the concept of linking inventory sites with financial dimensions, as illustrated in the next screenshots. 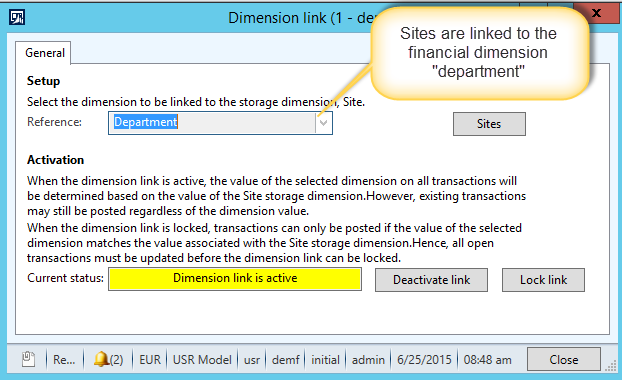 With the inventory dimension link setup, the only thing required when recording return orders in Dynamics AX is selecting the correct site. The change of the inventory site ensures that the correct financial dimension is automatically picked up for the credit note posting. As a result, return order sales can be identified by filtering on the financial dimension that has been linked to the inventory site that is used for return orders. A major advantage of this second approach is that no manual entry of a main account in the return order form is required, which considerably reduces the risk of making errors. Yet, irrespective of this advantage, problems might arise due to conflicts with the inventory and warehouse setup. For that reason, this approach might not be feasible in all company environments. An additional disadvantage with this approach is that it might require the setup and use of an extra financial dimension. If you do not like the previous approaches for separating sales order revenues from return order revenues e.g. because they are not feasible within your company environment, you might think about making a system adjustment. In the following, I will show you one possibility how a simple system modification is able to separate sales order revenues from return order revenues. 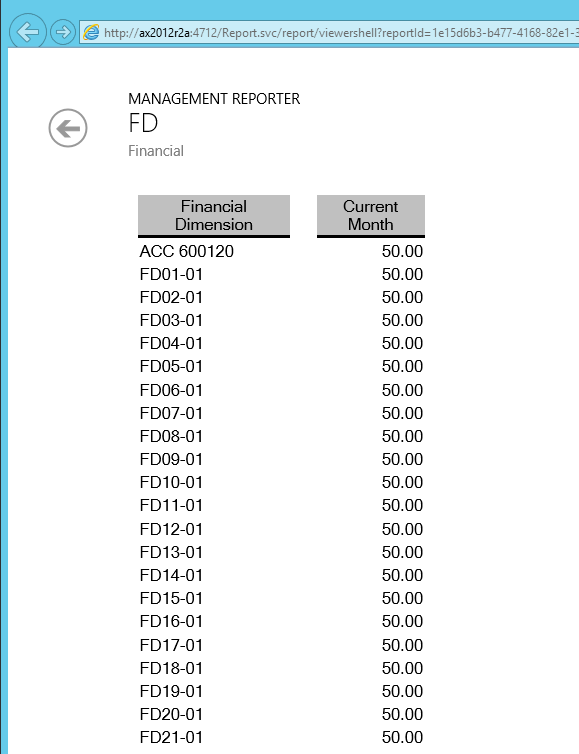 The idea of this system adjustment is that the revenue account that is used for return order revenue postings – in my example main account 405000 – is taken from the “deferred revenue on delivery” section in the inventory posting form. Hint: The underlying assumption is that the “deferred revenue on delivery” inventory account type is not used in your company. If you use this account type, simply chose another account type that is not used. 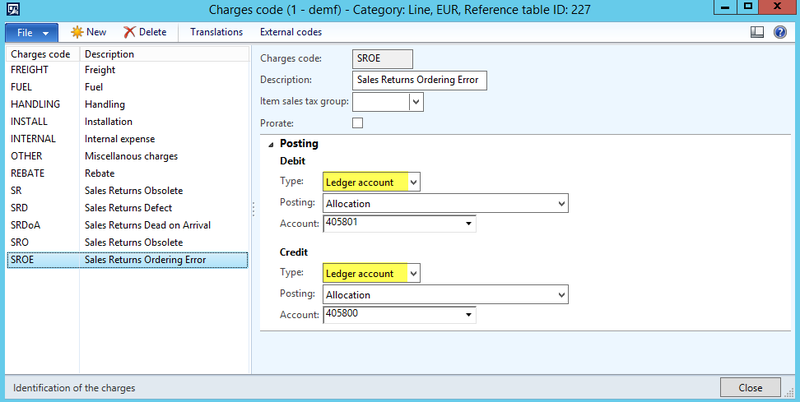 If you use all account types, simply make an additional country-specific account type available for the only purpose of holding the ledger accounts used for posting return order revenues. For the purpose of this example, I will continue with the invent account type “deferred revenue on delivery”. I made the following adjustment to the load segments method of the return table form to use the accounts setup in the “deferred revenue on delivery” section for return order sales transactions. 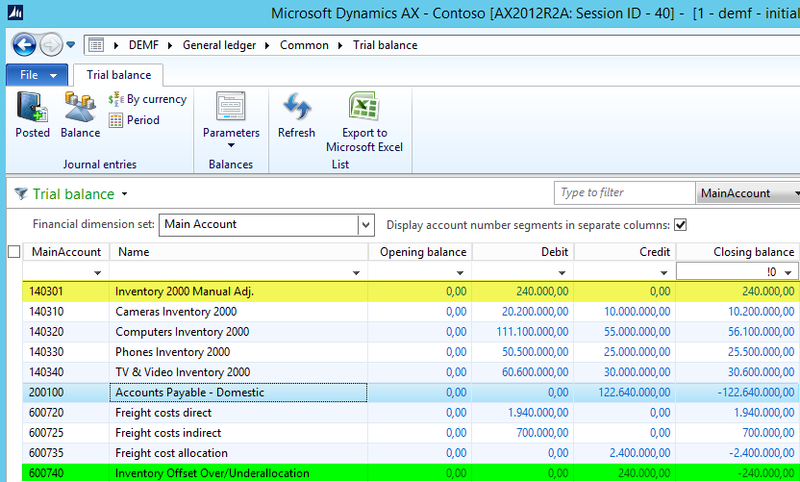 This adjustment “brutally” overwrites the main account that Dynamics AX uses by default by referring to the account that has been setup in the “deferred revenue on delivery” section of the inventory posting form. That is, by referring to the account that has been setup for the invent account type “SalesPckSlipRevenue”. In the example chosen, the default main account 401100 transferred from the original sales order is overwritten by main account 405000 and used for posting the credit note as illustrated in the following screenshots. A major advantage of this approach is that it can be realized by implementing a minor system adjustment that makes the manual entrance of main accounts superfluous. This fact significantly reduces the risk of generating wrong postings for return orders. The disadvantages of this last approach are (a) that you need a developer to implement the code adjustment and (b) that this approach does not help you differentiating revenues based on the reasons why customer returned items. If this differentiation is important for you, please have a look at the next subsection that illustrates how this separation of revenues based on return reasons be realized. 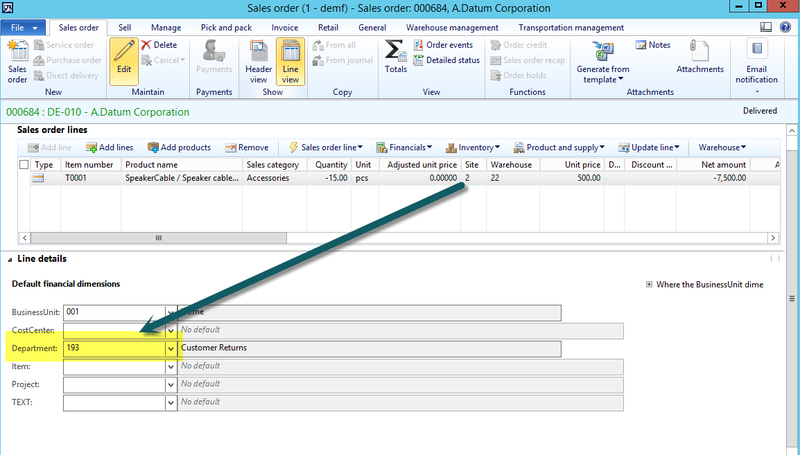 Within this last section of this post, I will give you some hints on how you can setup Dynamics AX in a way that allows you separating (a) sales order revenues from return order revenues and (b) the reasons why items where returned from customers. The way how this can be realized is by linking the different disposition codes – that are used when processing return orders – with automatic charge codes, as exemplified in the next screenshot. Please note that the charge codes are setup with the category “percent” and a “charge value” of 100%. Each of those charge codes is setup with a debit and credit posting type “ledger”, which simply serves the purpose of creating an additional posting line that allows identifying return order sales. 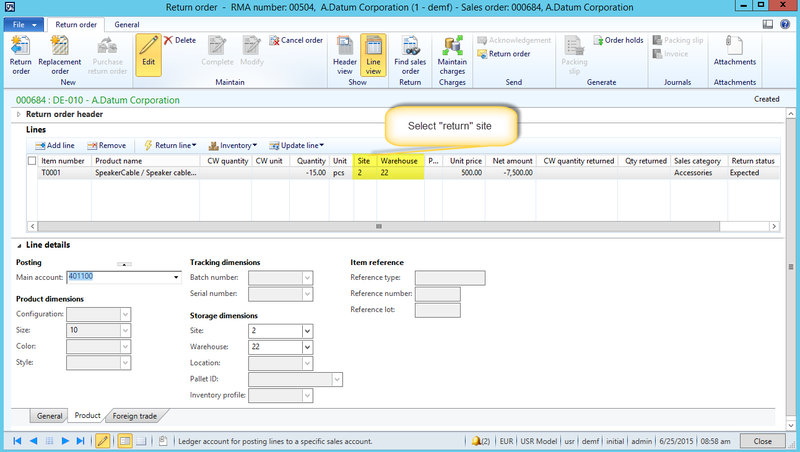 On 1st August a sales order invoice for 100 pcs of an item for a price of 322.00 / item is recorded in Dynamics AX and generated a voucher that posts the sales revenue on main account 401100. Please see the following screenshot. Eight days later, the customer returns 10 pcs of the items sold. 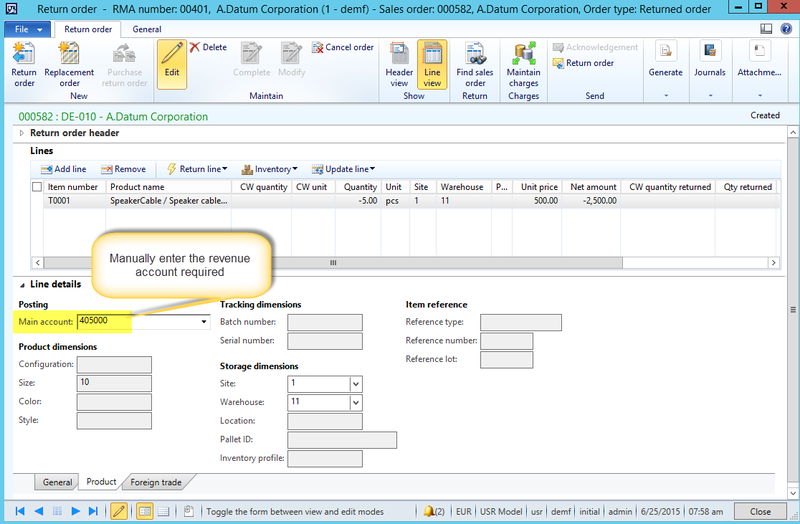 This return is recorded in Dynamics AX by using the return order functionality in the sales and marketing module. 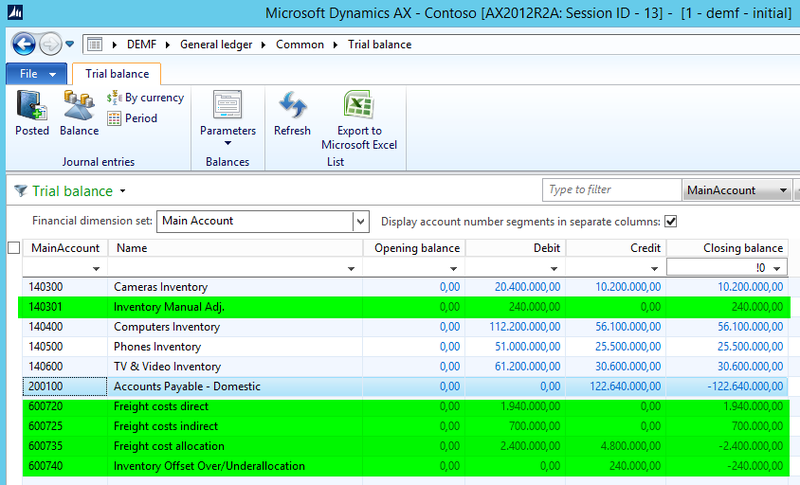 Please note that no change has been made to the main account that Dynamics AX automatically picked up from the original sales order. The next steps are specifying a disposition code and posting the return order packing slip and credit note. The outcome of those process steps is a credit note voucher that recorded the return order revenue on the same main account that was used for posting the original sales order revenue. 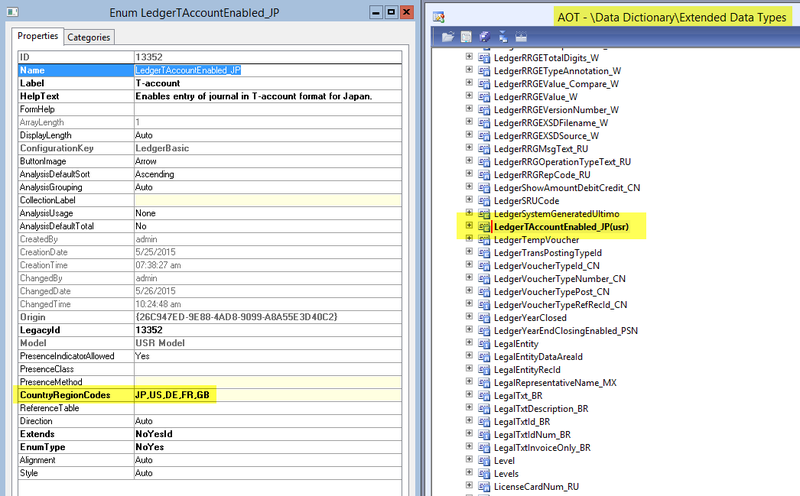 In my example, main account 401100, highlighted in yellow in the next screenshot. Yet, due to the link of the disposition code used with a charge code, an additional posting was generated – highlighted in green color. This additional posting allows identifying the sales return revenue amount for the specific return reason. The sum of the yellow lines (22540.00 + 6440.00 + 3220.00 = 32200.00) represent the total sales revenues that have been recorded in this month. The sum of the green lines (6440.00 + 3220.00 = 9660.00) represent the total amount of sales returns from customers in this month. As different charge codes have been setup for each disposition code, customer returns for “dead on arrival”, “ordering errors” and other reasons can easily be differentiated directly in the General Ledger by referring to the main accounts (405700 and 405800 in my example). The major advantage with this last approach is that no system adjustment is required and that all transactions can be realized with standard Dynamics AX tools. The major disadvantage is that many new ledger accounts and charges codes need to be setup and – for that reason – that the interpretation of the monthly results gets more complex. To sum up, there are several approaches available in Dynamics AX that allow you separating sales order revenues from return order revenues. I hope that the information provided in this blog post allows you choosing an approach that fits best into your company environment. 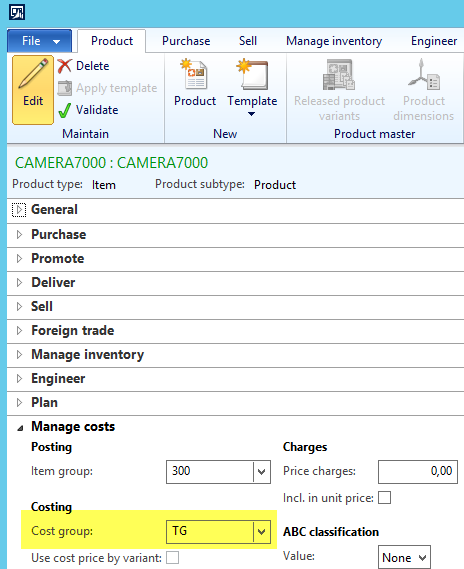 You might have noticed that Dynamics AX does not generate any voucher when you post the product receipt for a purchase order that includes goods that are setup only as procurement categories. The following screenshot shows this standard behavior for the purchase of “staplers”. The fact that Dynamics AX does not generate any voucher is a disadvantage from a finance & controlling perspective especially in situations where the receipt is recorded in one month and the invoice in the following month. The disadvantage is that the expense reported in the profit & loss statement is incorrect (too low) and that the balance sheet does not include an accrual for those expenses. 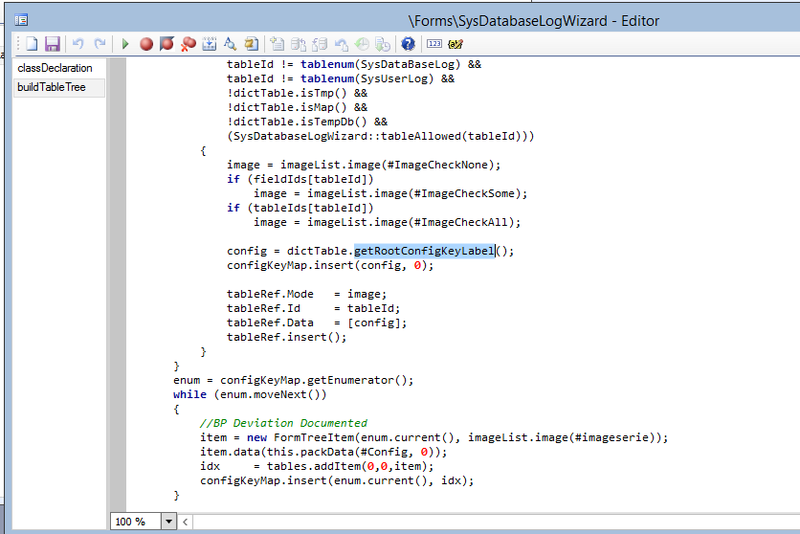 Fortunately, you can change this standard behavior by doing some minor changes in the setup of Dynamics AX. The setup I am talking about can be realized by using a purchasing policy and activating the parameter “accrue purchase expense on receipt”. See the following screenshots. 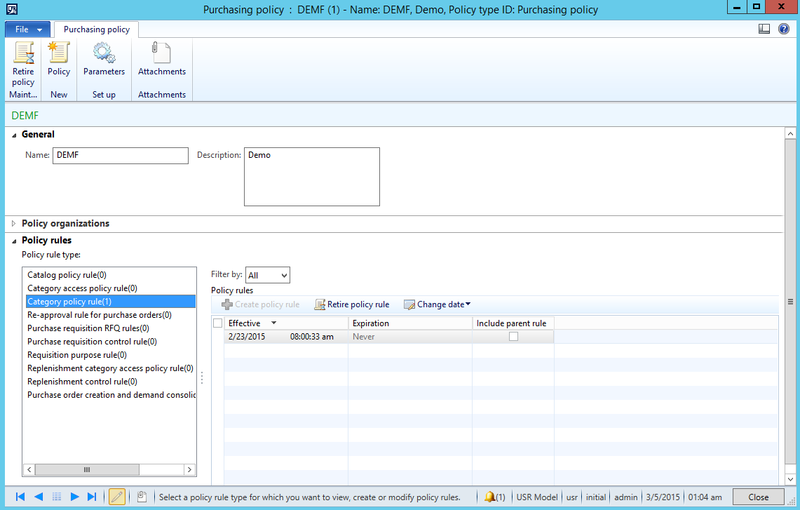 After activating the aforementioned parameter, Dynamics AX generates a voucher once you post the product receipt for your procurement categories. 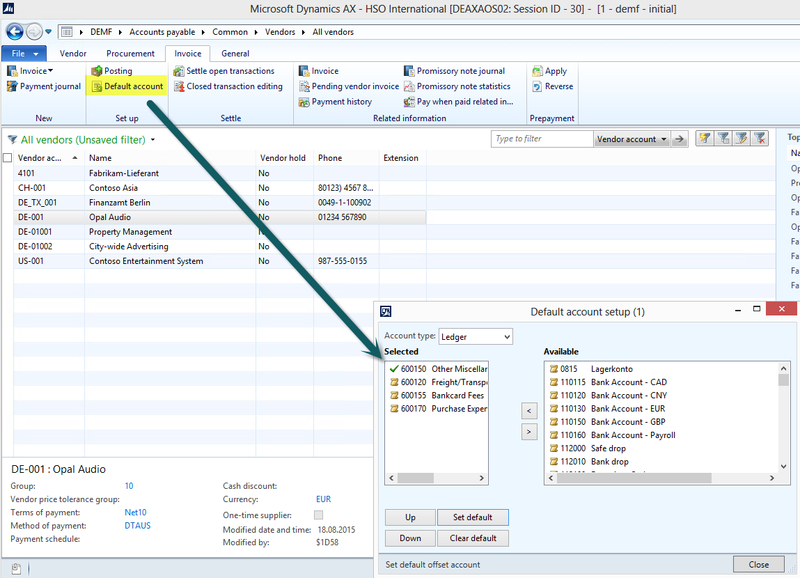 Please note that Dynamics AX uses the “purchase expenditure, un-invoiced” account for the debit posting and the “purchase, accrual” account for the credit posting. 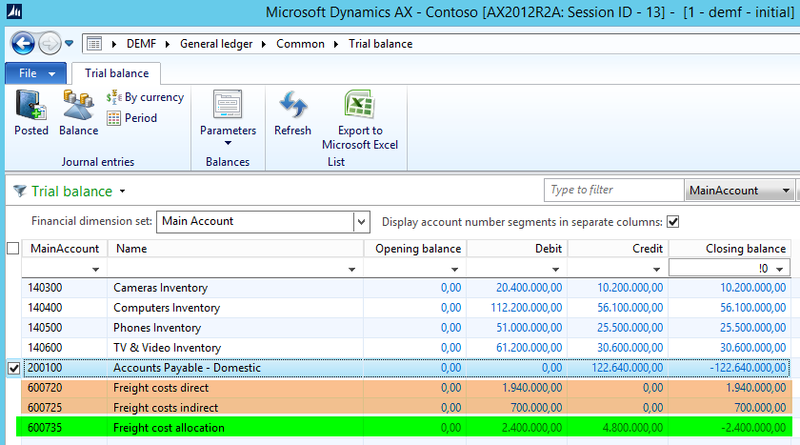 As usual, Dynamics AX reverses the transactions that have been generated during packing slip posting when the invoice is posted. 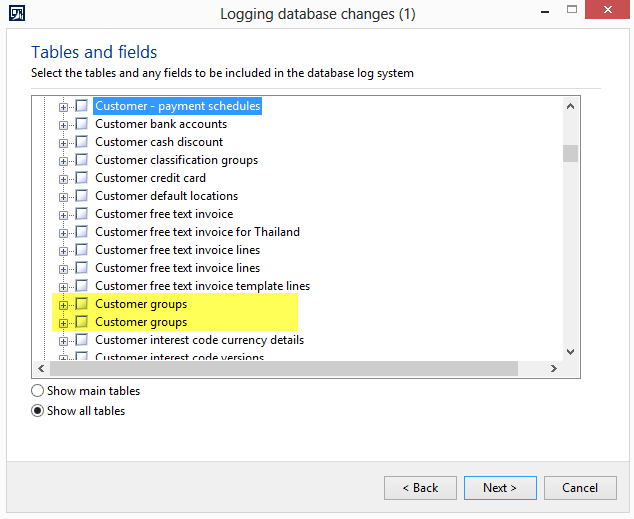 Within the previous two blog posts I showed you the setup of the database log and how it can be used to trace changes that have been made to different tables / fields in Dynamics AX. While the database log helps you identifying the ones who made “mistakes” in the system, the Dynamics AX electronic signature feature can help you preventing those mistakes in the first place. In order to realize this, I use the standard Dynamics AX electronic signature functionality slightly different than intended. 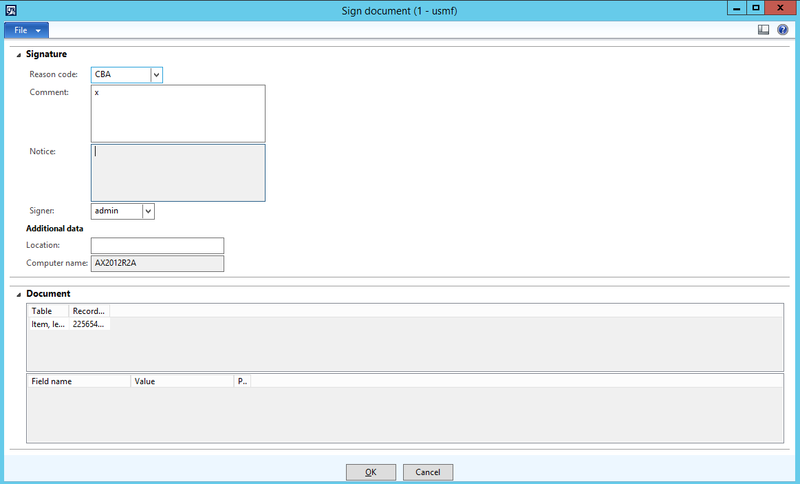 (For details on how to use the standard Dynamics AX electronic signature functionality, see e.g. the following TechNet site). I will illustrate you this slightly different usage of the electronic signature feature based on the following example. In the organization administration module, I setup an electronic signature requirement for changes – other than inserts – to the inventory posting table. … the electronic signature window pops up. 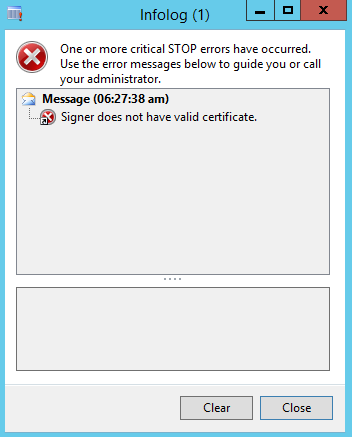 In summary, by setting up electronic signature requirements without the required electronic signature certificates, critical Dynamics AX tables/fields can be locked for changes without making system modifications. Against the background of the changes illustrated in the previous blog post, I logged the following tables/fields that are in my opinion the ones that should – from a financial perspective – be tracked at a minimum. Please note that the previously illustrated tables that should get logged from a financial perspective represent my opinion. This selection is not meant to be exhaustive nor definite and aims to provide you with a starting point for setting up the database log. Please also note that you should avoid logging transaction tables as logging them might have a negative effect on system performance. If you miss important tables/fields that should be logged in any Dynamics AX setup and country-environment, feel free to leave a comment on this site to help other Dynamics AX users getting their setup right. If you ever used the Dynamics AX database log you might have realized that it can be pretty hard to find the correct tables and fields that you need to log. 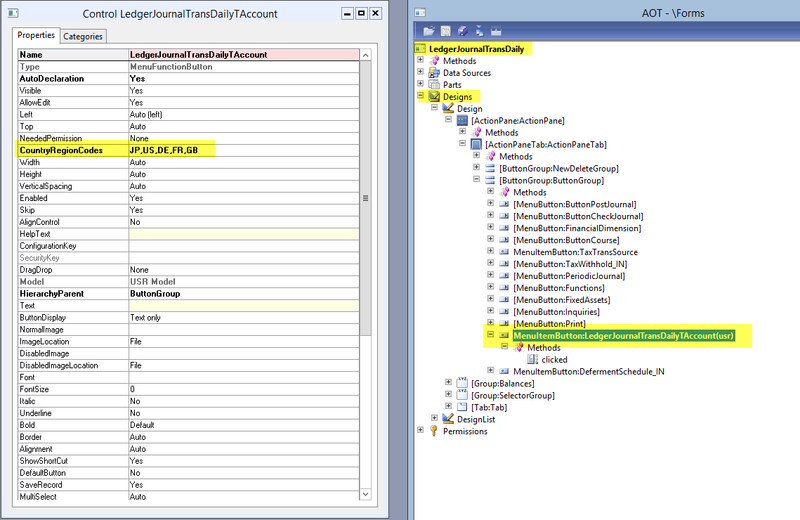 One of the underlying reasons for those difficulties is that the elements that you can find in the database log window use labels that differ from the names that you can find in the AOT. 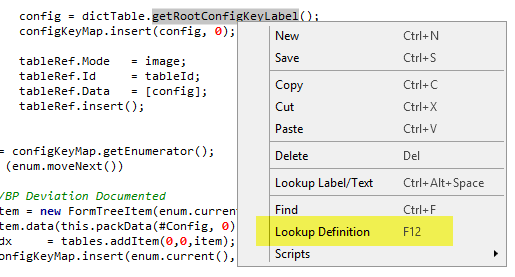 Due to the use of labels, some of the elements that you want to have tracked do even appear double in the database log setup window (see the following screenshot for an example). 1. The first change made ensures that the AOT table names rather than labels are referred to. This can be realized by making the following adjustment (see the next screenshots). Through the changes illustrated in the previous two screens, I ensure that the ConfigKeyLabels refer to names rather than labels. 2. 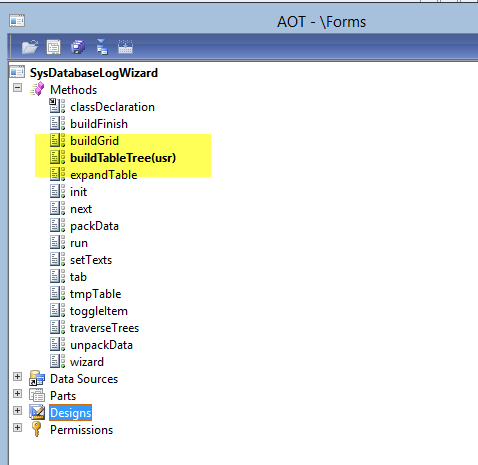 The second change that I made is including the AOT name in addition to the label name in the Logsetup section of the database logging wizard This change allows identifying the AOT table names and the original labels used and helps ensuring that the correct tables and fields get logged. 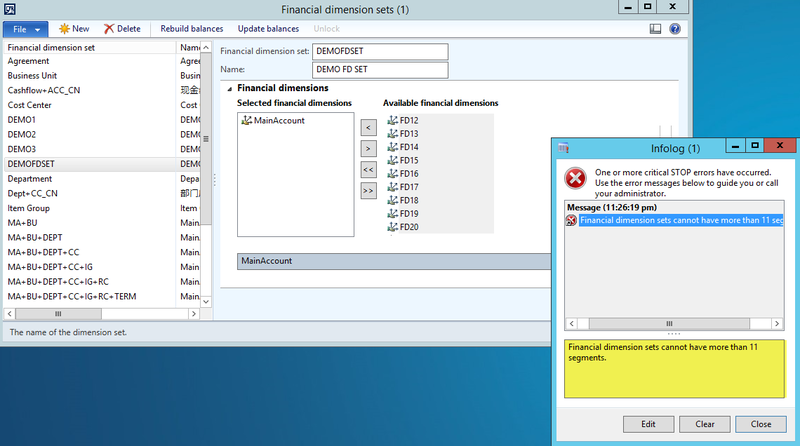 If you needs to work with more than 10 financial dimensions – in addition to the main account – you will quickly notice that you are not able to add more than 10 financial dimensions in the account structure configuration window (see the following screenshot). 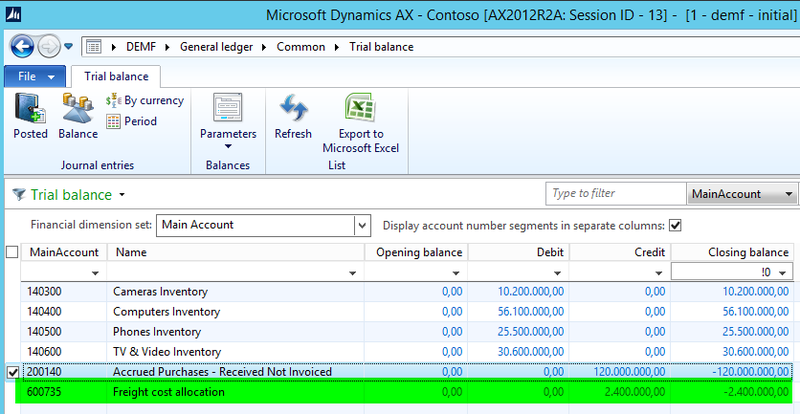 If you try to do a similar analysis via the trial balance list page in Dynamics AX you will notice that this cannot be done without making a system modification because the required financial dimension set only accepts a max. number of 11 financial dimensions (main account + max. 10 financial dimensions). A possible workaround is setting up several financial dimension sets that include max. 11 financial dimensions. 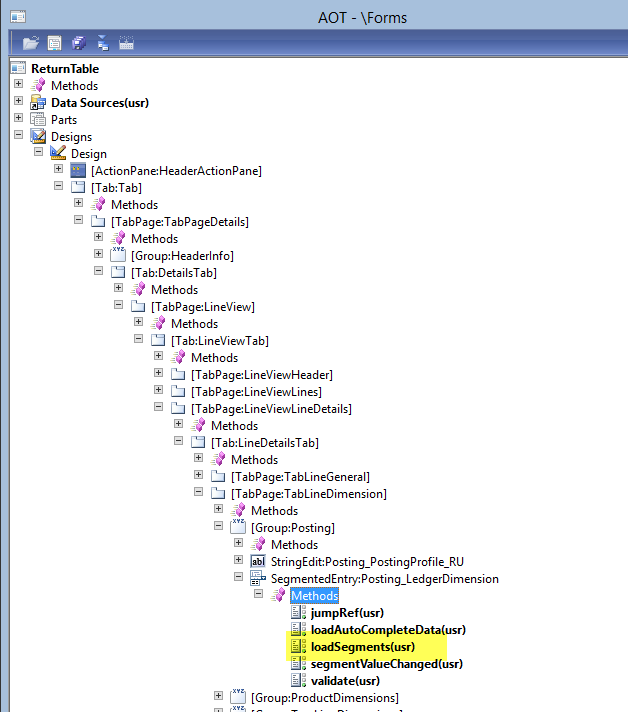 If you ever got furious about the standard Dynamics AX “breakdown of voucher” functionality, the following post might provide you with an alternative solution that can easily be implemented. 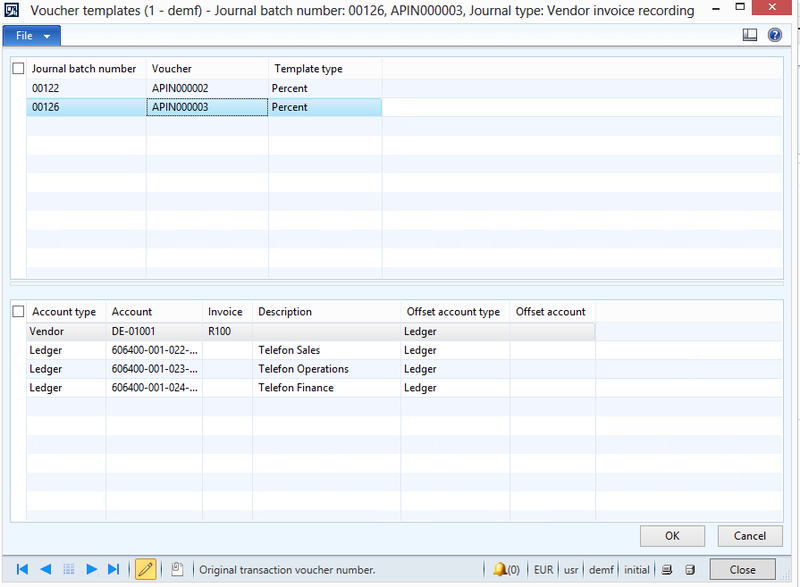 Now let’s have a look at the T-account feature and how you can enter the same invoice details using this functionality. 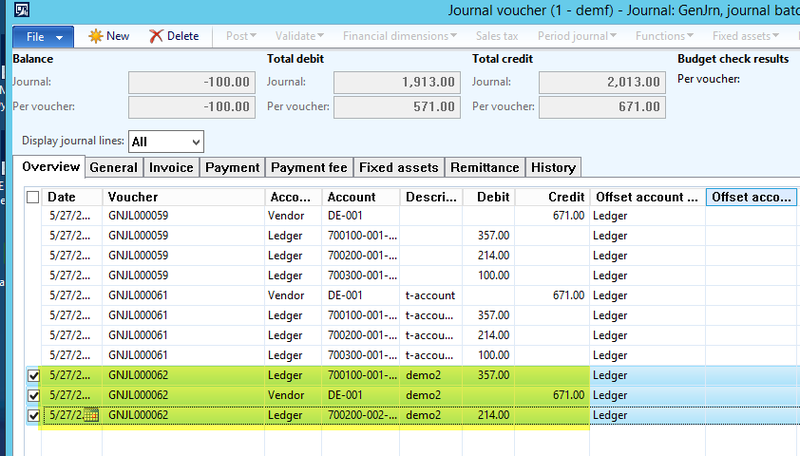 Step 2: In the T-account form, you can find the credit transaction that has been entered in the journal voucher form. Complete your transaction by entering the debit transactions as required. Note: You can personalize this form as any other Dynamics AX form and incorporate for example the sales tax fields into the debit and credit sections as illustrated in the following screenshot. 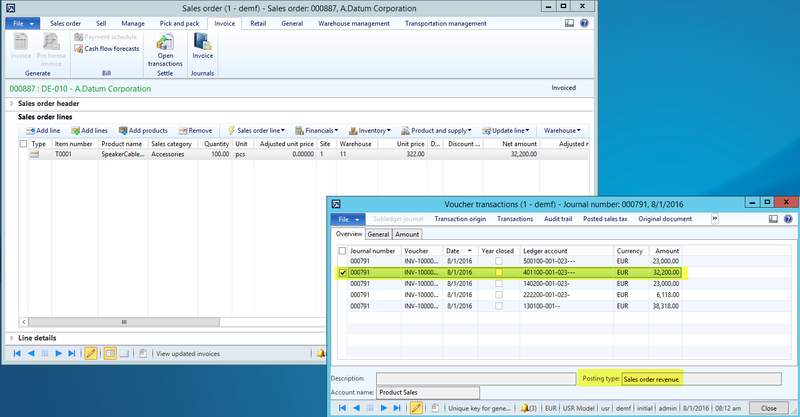 Step 3: Once you close the T-account form, the T-account lines are transferred to the journal voucher form. 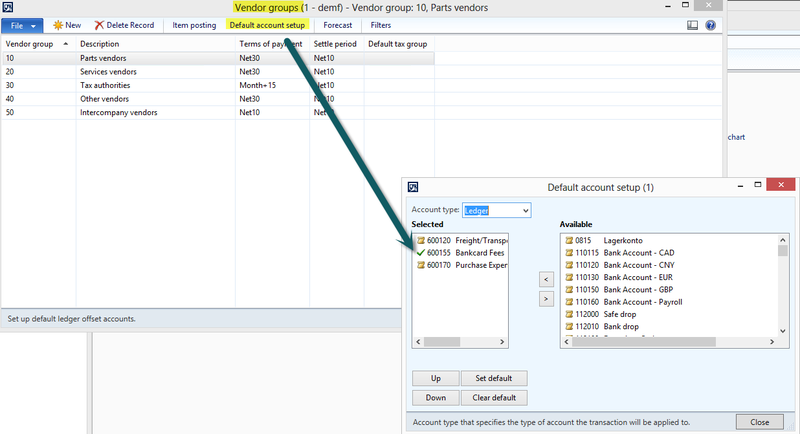 Note: As illustrated, the T-account form provides you with a greater flexibility in regards to entering voucher lines in Dynamics AX. What is more, you are not limited to entering only ledger accounts but you can also select other account types, such as customers, fixed assets, etc. Finally, the T-account form allows you transferring transaction lines to your journal even if debit and credit amounts do not match (see the following screenshots for an example). 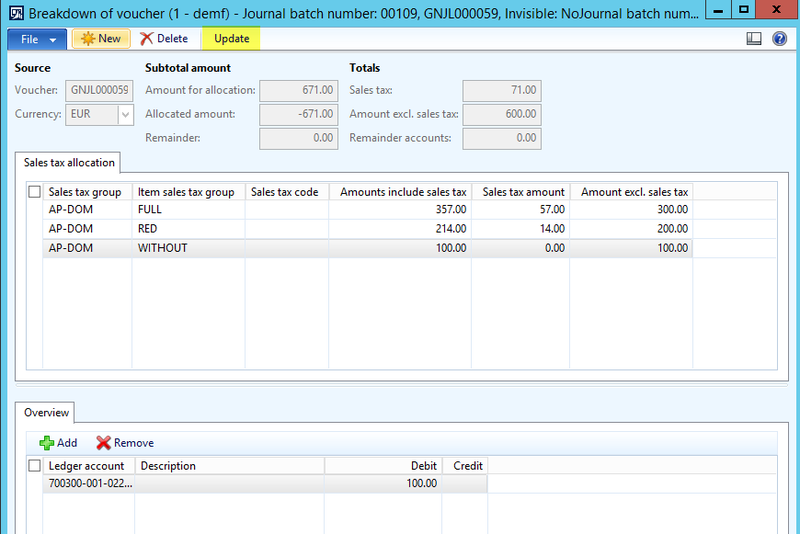 Transferring incomplete transactions from the T-account form to your journal does not mean that this incomplete voucher can be posted, yet it provides you with more flexibility in the way how you enter vouchers in Dynamics AX. 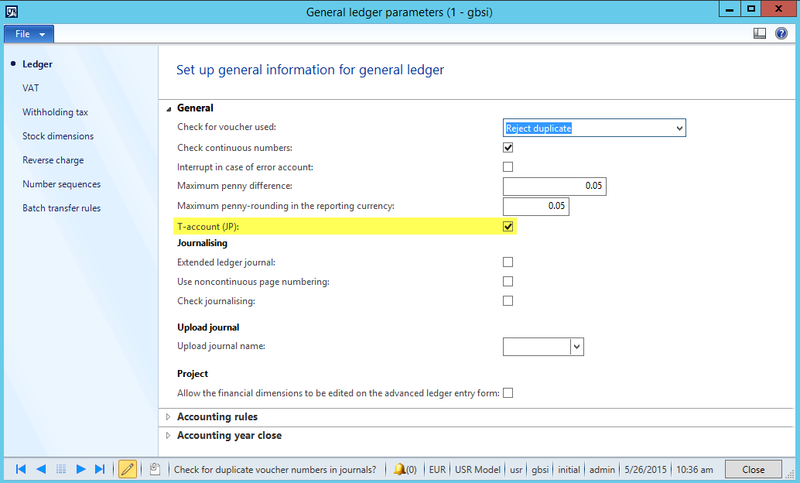 As a result, the T-account parameter becomes available in the General Ledger parameters form. Activate this parameter. 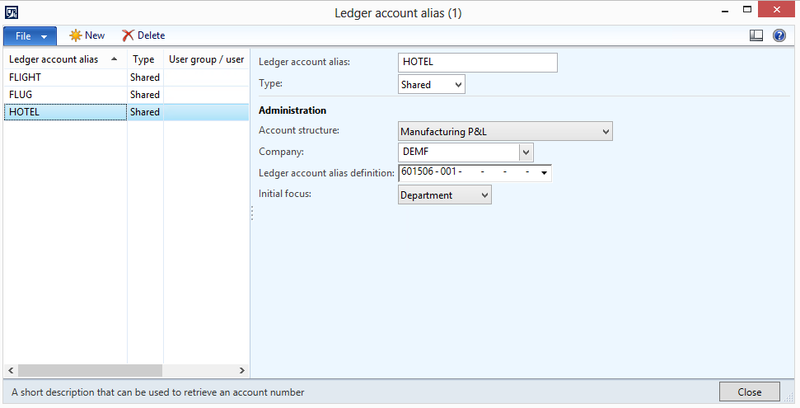 Modification 3: Enable the country codes you require for the TAccount menu item button in the LedgerJournalTransDailyTAccount form as illustrated in the following screenshot. Please note that the T-account form is by default only available in GL daily journals. Yet, making this form available e.g. 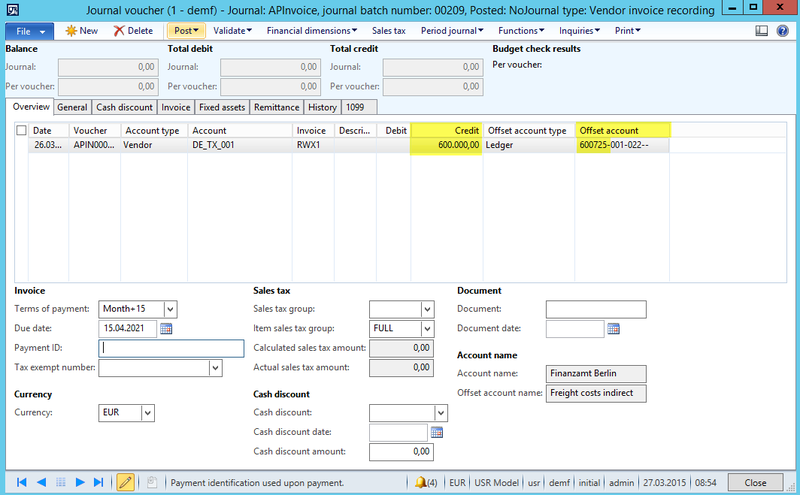 for AP invoice journals can easily be realized based on the previous system modifications illustrated. This blog post continues the previous one by illustrating an alternative approach how incidental acquisition costs can be incorporated into the total acquisition costs of a company’s inventory. The sample data used in the following are the same that were used in the previous post and are illustrated once again in the next screenshot. As before, I assume that a company purchased various items (cameras, computers, etc.) for 100 mio. EUR in a given year and that the different vendors that supplied the items charged 1.4 mio. EUR for transportation & freight to deliver the items to our warehouse. In addition to the direct freight costs, 600 TEUR indirect freight costs that could not directly be linked to any product / purchase order were recorded in Dynamics AX. In the following year, for a purchase volume of 120 mio. EUR, a total of 2.64 mio. 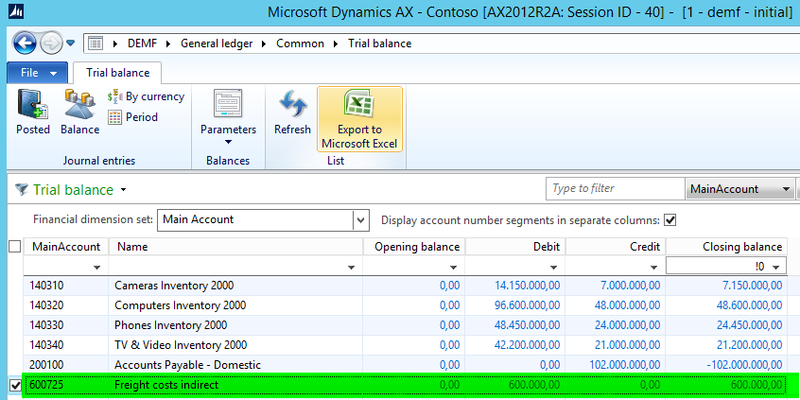 EUR of direct and indirect freight cost were recorded in Dynamics AX. Previously, an automatic charge ensured that the total freight costs were recorded in the inventory accounts in the company’s balance sheet. Rather than using automatic charge codes, the same result can be achieved by making use of the costing sheet functionality in the inventory module. How this can be realized is illustrated in the following. The first step is to link your products with a cost group. 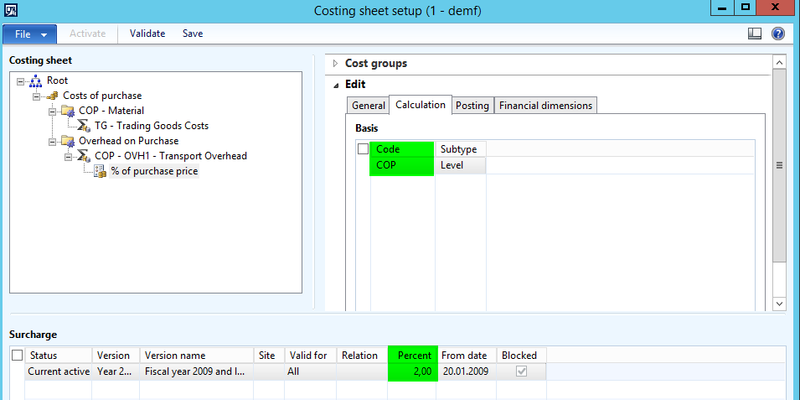 After linking your products with a cost group you can refer to this cost group in the costing sheet simply by selecting this cost group in the corresponding field. Thereafter a surcharge node needs to be setup. 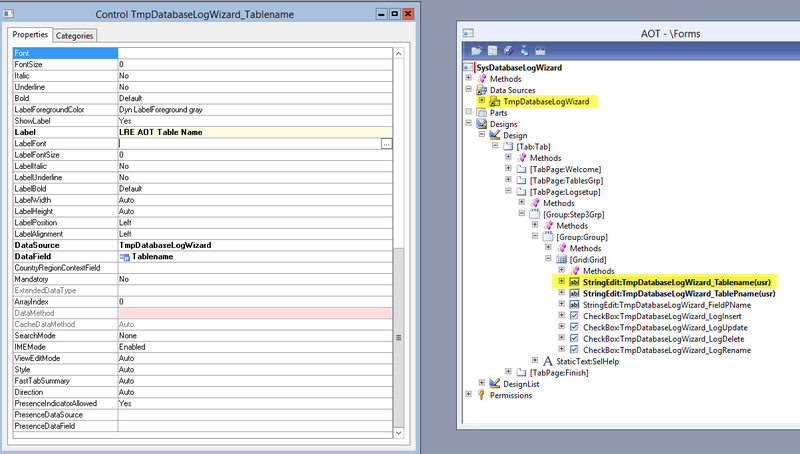 This node is linked to the COP node which includes the TG cost group specified before. Once this link is established the surcharge percentage needs to be specified. In this example I use a surcharge of 2%. 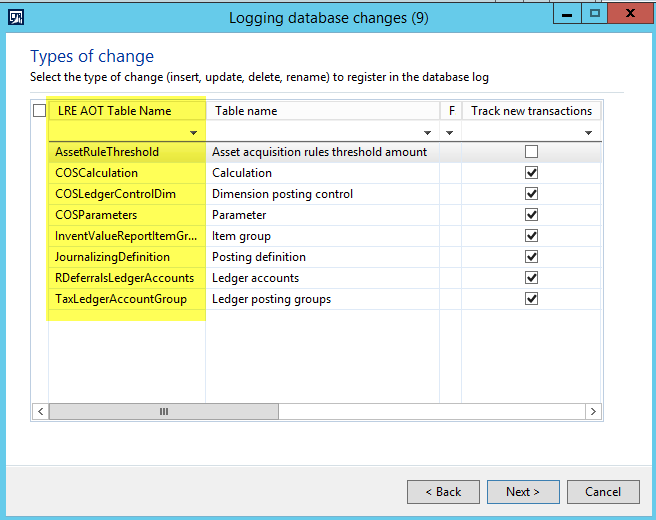 Finally, the ledger accounts need to be setup in the posting window. The accounts used here are the same that were used in the previous post for the automatic freight cost allocation. With this setup, Dynamics AX is posting a freight allocation when purchase order packing slips are posted. This is different from the previous approach where the freight allocation was posted at the time the vendor invoice was posted. After recording the vendor invoice and the indirect freight costs – as illustrated in the previous blog post – a total of 240 TEUR remains on the freight cost accounts in the profit and loss statement (total of ledger accounts 600720 to 600735). Yet, by using the same ledger allocation rule as before also this remaining amount is shifted to the inventory accounts in the balance sheets ensuring that all incidental costs are included in a company’s inventory. Within this post I will describe how incidental acquisition costs such as transportation and handling costs can be incorporated into the total acquisition costs of a company’s inventory. Most accounting regulations such as German business law, IFRS and US-GAAP explicitly require including incidental acquisition costs into the cost of a company’s inventory. For details, see e.g. §255 HGB, IAS 2, ARB 43 Ch. 4. 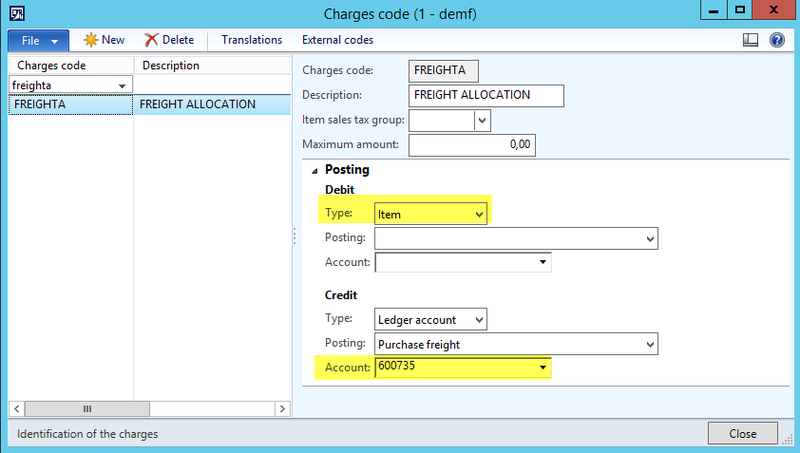 One option to incorporate incidental acquisition costs, such as freight charges, into a company’s inventory is using a charge code that is setup with a debit posting type “item” as illustrated in the following screenshot. 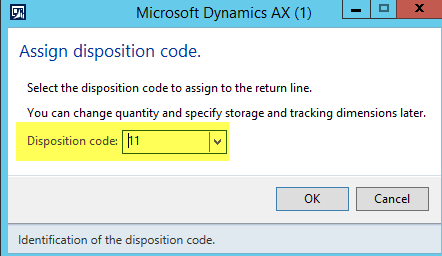 Using charge codes is a good practice in Dynamics AX as long as a direct relationship between the direct and incidental acquisition costs of an item exists. Yet, if this relationship does not exist – e.g. because your freight forwarder send summary invoices for all shipments that have been made within a specified period – using charge codes similar to the one illustrated above might not be the right solution. That is because manually allocating freight charges to the different purchase orders and items is not manageable in practice. One possibility how this problem can be overcome will be illustrated below based on the following example. Within this example I assume that a company purchased various items (cameras, computers, etc.) for 100 mio. EUR in a given year. The different vendors that supplied the items charged 1.4 mio. EUR for transportation & freight to deliver the items to our warehouse. 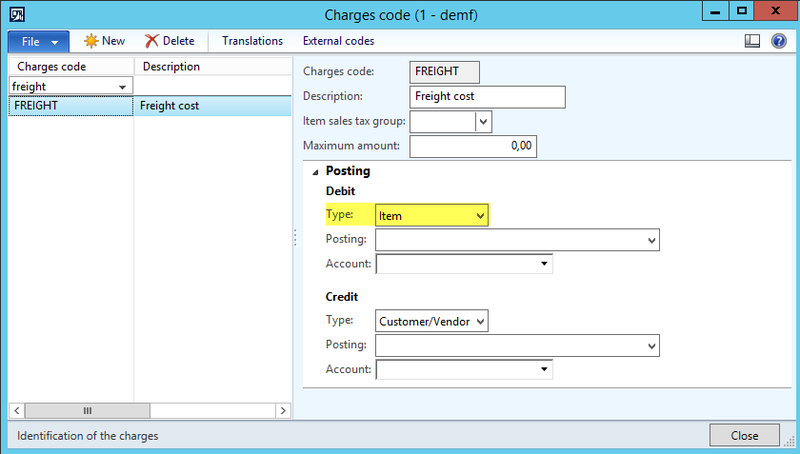 Those freight costs were recorded in Dynamics AX by using a charge code that has a debit posting type “item” setup. As a result, 101.4 mio. EUR were recorded as total inventory costs in the company’s inventory accounts (140300-140399). In addition to the direct freight costs, indirect freight cost invoices for another 600 TEUR were received and recorded in Dynamics AX. As those invoices had no direct relationship to purchase orders and/or item transactions, those invoices were directly recorded as an expense on ledger account 600725. Because of this treatment, the total inventory value is understated by 600 TEUR. The first change is setting up a new charge code (“freight allocation”) similar to the one previously used. 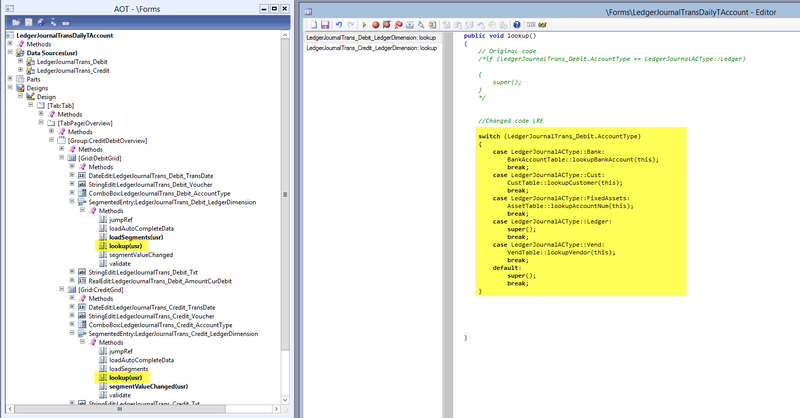 The main difference is that this new charge code is setup with an offset (credit) posting type “ledger account”. Thereafter, the newly created charge code is setup as an automatic charge code to ensure that every item transaction gets an additional 2% freight charge allocated. (Note: the 2% charge value is derived from the relationship between the total freight costs and the purchase volume in the previous year). To avoid that freight charges are included twice in a company’s inventory value, a new direct freight charge code (“Freight new“) is setup next. This charge code is used in all purchase orders to record freight charges that vendors invoice directly. That is, this code will be used in situations where a direct relationship between purchase orders/item transactions and freight charges exists. 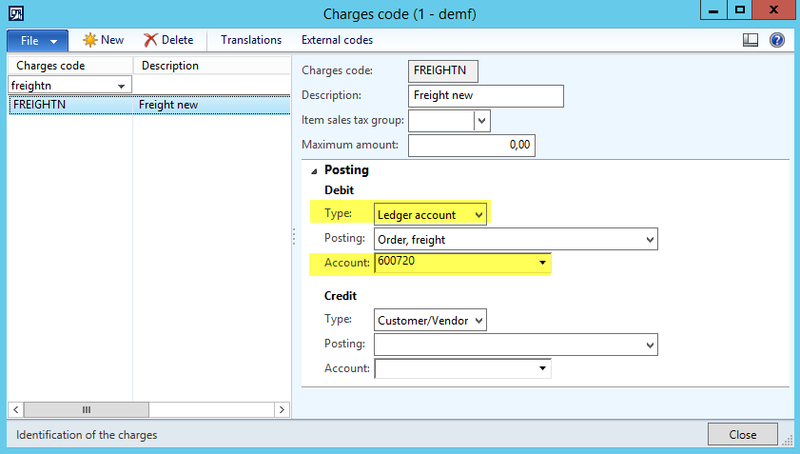 Note that this freight charge code is setup with a debit posting type “ledger account”. In the following year, a total of 2.64 mio. 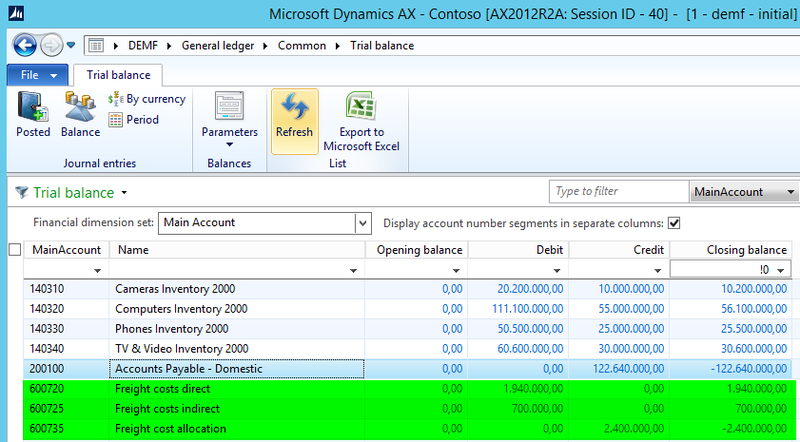 EUR of direct and indirect freight cost invoices are recorded in Dynamics AX. Due to the newly setup direct freight charge code “Freight new” – see step 3 before – all freight costs are recorded on expense accounts (account 600720 and 600725). Thereof, a total of 2.4 mio. EUR are allocated to the inventory accounts due to the automatic charge code that was setup in step 2 (see the balance on ledger account 600735 below). The difference between the actual recorded freight costs of 2.64 mio. EUR and the allocated freight costs of 2.4 mio. EUR represents the amount by which the company’s total inventory is undervalued. This undervaluation can be explained by the automatic freight allocation percentage that was setup (2% of the purchase volume) and the actual freight costs recorded (2.2% of the purchase volume). The following graph exemplifies this relationship by showing actual and allocated freight costs and the resulting over-/underallocation for the current year. Given that the over-/underallocated freight cost amount is small and negligible from a global company perspective, the first option is not to make any adjustment to the over-/underallocated freight cost amount and to leave the remaining amount in the profit and loss statement. If a significant amount remains on the freight accounts in the income statement, a General Ledger allocation rule can be used to shift the un-allocated amount from the freight accounts in the income statement to the inventory accounts in the balance sheet. This can be realized by specifying that the sum of the freight expense accounts (600720-600735) will be allocated to an inventory account used for posting manual adjustments; in the example used, account no. 140301. 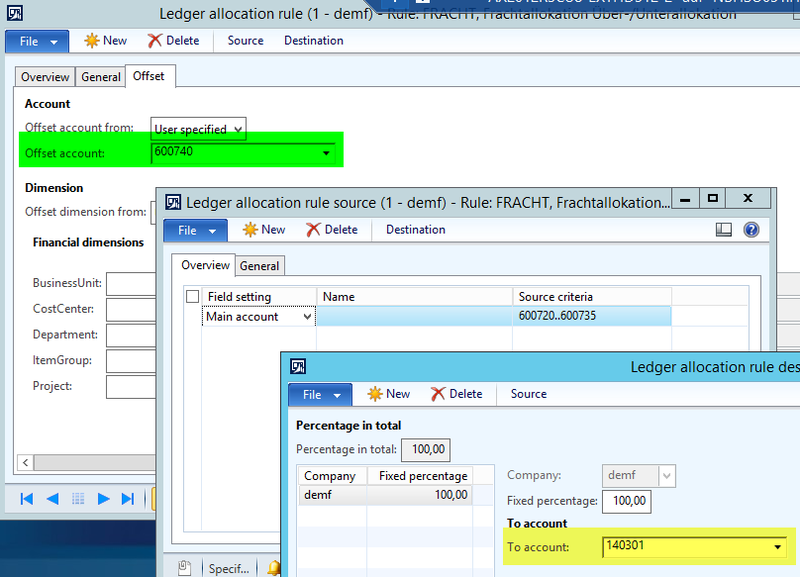 After running the ledger allocation rule in General Ledger the sum of all inventory accounts (140301-140340) equals the total purchase cost plus the total (direct and indirect) freight costs. In the example used 122.64 mio. EUR. At the same time, the freight expense accounts in the income statement (600720-600740) add up to 0 EUR, illustrating that all freight costs are recorded in the balance sheet. Note that using this option has the disadvantage that the remaining over-/underallocated freight cost amount is shifted to the inventory accounts in the balance sheet at the General Ledger level only. In other words, the postings generated by the allocation rule cannot be identified in the inventory module. To overcome the disadvantage of the previous option, a direct inventory value adjustment can be recorded in the inventory module as illustrated in the next screenshot. The major advantage with this option is that inventory values in General Ledger and the Inventory module match automatically. Yet, this advantage comes at the cost of a higher complexity and effort to identify and record the amounts that need to be adjusted. (Among others, you have to clarify how to distribute the remaining over-/underallocated amount to the different inventory items). Irrespective of the option chosen to handle the remaining over-/underallocated freight costs, it is a good practice to review the automatic freight allocation charge setup at least once a year to ensure that the total over-/underalloacated amount remains small.